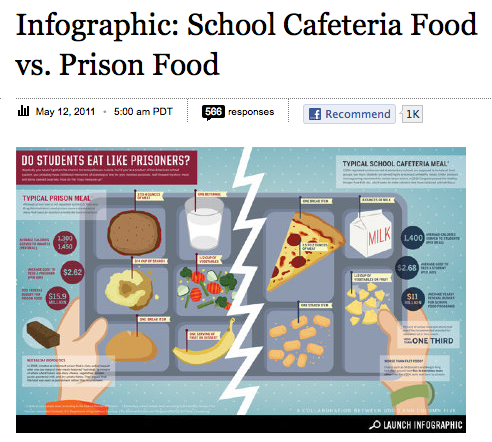 Good Magazine recently created this infographic depicting the similarities between prison food and food served in public schools. Here, Kathleen Nolan discusses ways in which schools are looking more and more like prisons and what needs to happen to change this detrimental pattern. Q. How many students look forward to going to school? This is difficult to know. There’s immense variation in experiences among students around the country, and there are a multitude of reasons for wanting to go to school or not. One thing I find interesting, though, in terms of what my own findings suggest, is that students attending poorly performing, highly controlled schools very frequently want to attend school despite the circumstances they face. This is largely because school is where their friends are, and they often have some identity within the school community in which they’re invested—sometimes that identity is based on personality, sometimes school success, and sometimes toughness. Additionally, even students with very tenuous relationships with the classroom often hold onto dreams of “turning things around” and doing well in school. So they want to attend. The vast majority of teens these days, I’d contend, really do understand the need for an education and credentials that will lead them on a path to viable work. Q. What do you make of mid-90s "zero tolerance" policies? How did they affect or inspire your research? Well, they certainly inspired the direction of my research. As I mentioned, I began to experience the policies firsthand as a classroom teacher. And of course, I began to read the new reports that were documenting the tremendous bias against black students, poor students, and students with special needs. But as a teacher in a racially segregated, low-income school, it wasn’t just zero tolerance the way it was being discussed nationally as increasing suspension rates that concerned me. In our school, we immediately began to see the relationship between zero tolerance and policing and the rapid growth of juvenile incarceration that also took place around that time in the 1990s. As I spoke with young people from predominantly white suburban schools around where I grew up, it quickly became evident that zero tolerance was playing out very differently along race and class lines. Q. Your study focuses on a high school in Bronx, NY. Have schools in other areas made your way into your research? How does your study implicate other schools or draw out national trends? Yes, well, in some ways, the school where I did my research represents an extreme. It is located in the city where order-maintenance policing was popularized internationally by former mayor Giuliani and then implemented in targeted schools by mayor Bloomberg. We would probably only find the intensity of policing I witnessed at UPHS at other poorly performing, racially segregated urban high schools with similar histories of violence. But the policing practices I encountered at UPHS reflect the dominant national ethos that values tough, punitive discipline. Zero-tolerance policies have caused explosions in suspension and expulsion rates around the country, and there are dozens of newspaper stories that document cases of kids getting arrested in schools for behaviors that are not necessarily violations of the law in urban centers like NY, Chicago, and Los Angeles. But we also can read of incidents of inappropriate police force in schools in suburban or rural areas in States like Florida and Texas, particularly involving black or Latino/a children. The focus of my research, though, was on incidents that never make it into the media. In the poorest, most marginalized communities, children getting confronted by the police and arrested isn’t newsworthy. As I’ve begun developing my next project that will examine the school experiences of urban and outer-ring suburban middle school students and critically and culturally responsive ways of addressing classroom management, I’ve learned, sadly, that my previous work on school policing resonates with parents, teachers, and community leaders in many of these small cities and outer-ring suburbs—places we don’t often see in the national news but where there is deep concern over the looming presence of the criminal justice system in their children’s lives. Q. There appears to be a bit of attention this summer on initiatives to end the "school-to-prison pipeline" that affects many of the nation's students. What do you think is the first step to making schools better places for students? Yes, I think the efforts of community groups that began organizing locally several years ago around the issues of zero-tolerance, school-based policing, and juvenile justice are finally catching the national attention they deserve. There are a number of very good research-based alternatives to zero-tolerance discipline. So as we move away from zero-tolerance and policing in schools, we already know what kinds of programs can and should be instituted in their place. These include school-wide Positive Behavior Support programs, models based on restorative justice, mediation programs, student-led anti-violence initiatives, and enhanced counseling and support services in schools. And it is essential that we lessen the role of police officers in schools and restore the moral authority of educators by creating structures that allow for regular, meaningful, and positive interactions between school personnel and students. Some of the best organizing that has been done has made explicit the connection between school funding, prison funding, youth unemployment and poverty rates, and education policy. In a nutshell, I agree with those groups that we need to address current circumstance holistically, or perhaps more precisely, structurally. We cannot make minor policy changes, such as the modifications we’ve seen in many states to zero-tolerance policies and expect real change. We need to shift our priorities as a nation and do what it takes to transform urban centers into healthy, working communities. We need to rethink our tendency toward mass incarceration, which actually has already begun, but there is still a gross over-use of the criminal and juvenile justice systems to manage social problems caused by poverty and racism. And finally, we need to think more critically and organize more rigorously around school reform. Politically popular reforms today—high stakes testing, the creation of charter schools, scripted programs and military-style classroom management—are misguided. I do believe that a vast majority of urban students struggling in low-performing public schools—those most affected by punitive discipline—want desperately to have meaningful classroom experiences. They want their academic needs addressed and they want to graduate and become productive members of society. In order for that to happen, however, we need reforms that helps create schools that are democratic and respectful spaces where parents are invited into the community and students find welcoming classrooms. They need teachers that can address their academic needs, provide relevant and inspiring lessons, teach them to think critically about their world, and direct them toward a bright future. When kids are engaged, there are far fewer disciplinary problems. Kathleen Nolan works in the Teacher Preparation Program and is a lecturer at Princeton University. She is author of Police in the Hallways: Discipline in an Urban High School. "Police in the Hallways presents a detailed ethnographic analysis of the ways in which discipline policies in New York schools have influenced the education and social experience of young people in so-called impact schools. Kathleen Nolan uncovers the complexity of the issues and exposes the unfairness of the policies in a subtle yet compelling manner."